More Patio Cover Ideas... Is Your Patio Covered? What patio cover ideas make your patio even more enjoyable? Need a few ways to filter or block the blinding sun? Maybe you’d like to have a way to cover your patio so you can use it even in the rain or other harsh elements. Arbors are another thought when it comes to patio cover ideas. You can build a simple arbor very easily or you could go all out and build the arbor of all arbors. 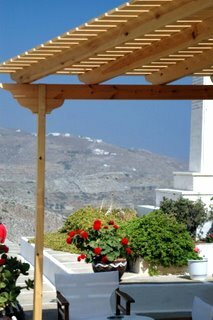 Another great option is to have an easy to assemble pergola or arbor kit delivered right to your door. Once your arbor is constructed, plant a quick growing vine so it will create even more of a natural roof for your patio. Be sure to keep the vines or ivy trimmed though, or they’ll take over the whole house and yard! One way to diffuse the light and add and abundance of shade and privacy is to screen your patio using naturally growing and traditional trees and shrubs. Granted, they will take some amount of time to fully develop and grow, but nothing beats the atmosphere created as the plants mature. Consider the type of foliage when pursuing this option. Some trees and shrubs are more enjoyable and effective as patio covers during certain seasons, but will be bare during others. And let’s not forget, because they are natural, they can be messy at times too. Think about falling leaves, sap, bird droppings, etc. How about those sail shades? Fantastic for patio cover ideas, they can be found on the internet in hundreds of sizes, shapes, styles and colors. Usually triangular, sail shades add a modern touch to your patio, while providing a totally functional weather resistant solution as a patio cover. Do make sure they are properly installed so they don’t literally “sail away” in the wind. Still want more patio cover ideas? 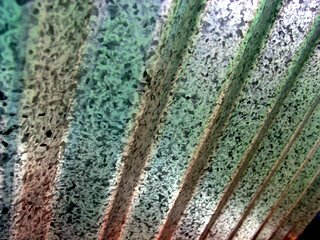 How about the tried and true corrugated metal patio roof? Virtually indestructible, once constructed it will provide the utmost level of shade only a non transparent material could. Also, a metal patio roof is most likely the best solution to keep water and other elements off of your patio. And who wouldn’t enjoy sitting in a swing, covered by the patio roof during a mid-summer rain listing to the soothing pitter patter of the rain drops on the metal roof? To cover or not to cover? The patio cover idea that lets you choose at a moment’s notice whether or not to have a patio cover is the retractable patio awning. Ordered to fit your dimensions, retractable awnings are a long lasting, practical, and stylish solution to keep the sun and elements at bay. But the best part is if you decide you’d rather have the sun shine down on your patio, you can the patio awning rolled up inside its enclosure. Use it when and how you choose! Hopefully, these patio cover ideas can either be used directly for your patio or at least spur some other ideas that will work for you. One thing is for sure, patio covers do extend the time patios can be used, making more of an “all season room” than you might expect. Good luck with your patio cover ideas!